Wouldn’t it be absolutely awesome to work for companies with unlimited vacation days? It would not only be worth your time but also help you take some time off! The good thing about these companies is that they understand your needs and would always want to give you your personal space and freedom. Plus there are several companies all over the world today who are willing to give you unlimited vacations and holidays. And if you are in search, then stop it right away because in this post we are going to tell you about some of the best companies that let you enjoy your holidays. 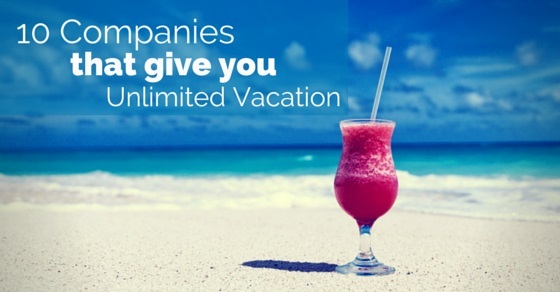 The following mentioned are few top companies that provide unlimited company vacation policy and company perks. Factual is definitely one of the best companies all over the globe that give its customers enough space. They are always willing to take care of your needs and giving you enough time to have fun outside work. The team is well known for its organisational qualities. Factual understands that crunching numbers all the time is difficult. So they give all employees and workers plenty of ways to just enjoy and relax. If you thought they just give you holidays then you’re probably wrong. Factual allows you to enjoy a nice cup of tea with all workers and lets you take breaks from office schedules. A second company we would like to mention today is none other than Sailthru. These guys are probably the best in the business. The team here likes to believe that every single user here is super unique and has interesting qualities that make them different from the other person. The company also understands that it is important to make a few investments. They have excellent leadership training and other sessions just for this very purpose. The working policy here is quite on the flexible side and there are several lunches sponsored by the company, happy hours along with chair massages too. A third company we must mention is Pocket. Pocket offers you some really beautiful and amazing offers. You will be surprised seeing that a company can do so much. It gives you a lovely looking desktop along with some app experience. The viewers are allowed to save videos, articles and posts which they may view later. Pocket also likes to believe that we are the best team that is very healthy and happy. On top of that, all of them are given membership to sports clubs in LA where they can spend time in leisure. The employees are free to take time off and come back recharged. Umbel is one of those companies that are willing to give you time and space. They help clients evolve and have a deeper sense of understanding of targets. They help you in managing data with the help of a decent interface. They have a wrestler mascot named El Umbel as well. All employees here are therefore hardworking, tactical and very technical at all times. ZestFinance has a very interesting goal that will definitely shock you once you learn. It helps around 60 million Americans who are not being supported by any traditional finance system to get hold of fair, transparent and credits that are very affordable and low in terms of pricing. The first point is that you are based in the beautiful city of Los Angeles; secondly, you can enjoy delicious lunch meals from local restaurants. And when you are in the need of leaving this great place for some important reason? Unlimited vacations are what you get. Paper G has been spoken about several times on newspapers and magazines. Apparently, it is a great ad engine that will pull all mad men out of the business industry. It is not only good for all business men but also the employees and the company itself. The senior executive of this company has also said that he is very happy being a part of this company since they give him enough space and several luxuries. They buy lunches for their employees, offering educational credits, conferences, courses etc that will definitely help in the expansion of skills and enough holidays to enjoy. Good companies are always willing to give you a good time. And Prezi is one that will definitely help you enjoy and maximise time. It will help people in communicating, wipe out all kinds of boring presentations and make life interesting and fun filled for all workers and employees. They have a very different kind of software here that allows you to engage and meet their audiences and share all heartfelt stories in new ways. Plus they give you several opportunities to travel all around the world. SoFi is out for all those graduates who are in search of a good and fresh job opportunity. They are willing to take care of the problem of student debt. Isn’t that wonderful thing? They always make it a point to connect with all graduates as well as the alumni along with other investors of the community through loaning funds etc. There are several fantastic events organised by these people. Some of the perks are quite fun. They include gym memberships, a cafeteria that is filled with great meal courses. The café also overlooks the Golden Gate Bridge that has unlimited time off. Chegg is a perfect educational hub that gives all its college students textbooks for rent, texts online, homework courses online, new opportunities to get a scholarship, take better control of their educational experiences etc. Chegg here gives you the golden opportunity to save time, economise and make use and get smart with time with the help of an online community. There are several perks that come with this company. Some of them include food, games, gym, wonderful employees to work with, nine holidays that are already scheduled from beforehand and five days where you may volunteer every year. Crowdflower is currently trying to change ways in which work needs to be done. The company is willing to give their clients some great data projects that can be broken later into tasks that are smaller and much more manageable. It has doled out several contributors from across the globe. It is their mission to make work productive as much as possible. FullContact is one of the best companies of all times. You will be surprised knowing the number of perks that come with this company. Here you will be given seven thousand five hundred dollars per year to enjoy yourself and have a good vacation. In fact, there are plenty of people who have gone on hikes, tried wine tasting, snorkelled a bit, tried rafting and so many other fun things through this. These are all paid vacation which means you don’t have to give a single dime. Netflix will definitely be worth your time once you get in here. The people here are absolutely amazing. They have a work policy of 9 am to 5 pm where all assignments will be completed. There is also no clothing policy here which means you don’t have to worry about what you are wearing. They give their employees enough freedom and the performance in companies like these is always high. They have great promotional and developmental opportunities. Everbrite is another company you must definitely try getting in. This company will change your life forever. The perks offered by this company are great. You will be given a monthly stipend of course but the good part is that it will cover all expenses. The treadmill desk is ever present and there is a kitchen full of healthy options you can always gorge on. They also have something called the zen room for all their employees where you will be getting catered meals and a great transportation stipend. Last but not the least, it’s Evernote! The team here caters lunches and snacks and spends around thousand dollars per week, plus you always get a week off once in a while. The environment is forever good and they have gym membership opportunities as well. The rules are regulations here are quite simple and the people in charge want to make sure you are growing along with them. So whether it is a quick game with a few co-workers, grabbing a cup of coffee, grabbing something delicious from the snack counter or even going on good vacations, there is no doubt you will come back more developed and productive. This brings us to the end of the discussion. We hope you have learnt enough about the best companies that give you best vacation policies and time to go on holidays. You can always tell us what you think about this post and how much it has benefitted you immensely. And till then, let’s hope that you find yourself a great position in one of these companies. Good luck! Next articleHow to Deal with Gaps in Employment History?